The immigration debate is everywhere. Not just in the United States, where it is focused, but worldwide as well. All eyes are on the country, especially now, with Barak Obama as President, to see if it will remain true to its liberal past of freedom and justice for all, to its immigrant history, to its long struggle to impose respect for universal civil and human rights, to its sense of humanitarianism, to the blood with which it drenched its own soil in order to abolish the enslavement of one race by another and to so many other shining examples of its vocation for often hard-fought, but eventually effective self-criticism and for simply doing the right thing, which, surprisingly enough, is also often the most expedient thing as well. Quite frankly, after eight long and grueling years in which the administration of George Bush (The Lesser) systematically violated, suspended, ignored and banned rights and principles that had always been considered basic to US-style democracy and decency, a lot of people elsewhere aren’t expecting much of us Americans anymore. Worse still, some Americans even had time during the Bush years to get used to the US thumbing its nose at “corny notions” like multilateral decisions on world security, due process, rule of law and respect for human rights, and started almost finding it ‘cool’ for their leaders to talk like Dirty Harry about such things – about smokin’ out the evildoers and killin’ ‘em – which, in their eyes makes Barak Obama “a wimp”. But hopefully, the current administration – in spite of a jittery economy, a radically hostile opposition, two wars that are looking more and more like an even longer and more pernicious nightmare than Vietnam, the worst oil disaster in the history of the world and a churlishly impatient public that apparently expected President Obama to soar in like Superman and, with a wave of his hand, fix everything that was not just broken, but utterly demolished, overnight – will find the time and energy to go out of its way toward restoring the battered image of the United States as the intellectual as well as material leader of the Free World. Like it or not, and whatever your personal stance may be, the immigration debate forms part of this context. It has for some time now, but it recently has been shoved to the forefront as a result of the unilateral decision of Arizona to impose its own rules which – despite all of the skewed logic with which the public is being bombarded by far-right commentators – are tantamount to racial profiling. Clearly, at this moment in its history, the United States has an immigration problem. And it is, for the most part – though not entirely – an Hispanic problem. Let me hasten to say that what I mean by this is that the main problem is in how the United States will deal with the influx of immigrants from that ‘ethnic’ group (whatever that means, since they hail from highly varied backgrounds), and not that the problem is theirs. The problem is, strictly speaking, a US problem. The United States is an immigrant country. While the majority of the US population is made up of whites, it cannot really be said that there is anything like a “typical American”. Unless, of course, you are only speaking of those who have descended from the 53 people who survived out of the 102 passengers who left England in 1620 aboard the Mayflower, bound for Virginia, drifted off course and ended up settling in Massachusetts. If not, then the vast majority of Americans are of immigrant stock and, technically, the first settlers were immigrants as well. The fact is that the only authentically “typical Americans” form less than one percent of the population and are not white, but ‘red’. All the rest of us are the descendants of “intruders” – thoug h I am proud to say that some genuine native blood does flow in my veins, thanks to my great-grandfather, Job Cavinder, who was half American Indian. Caption: My great-grandfather, Job Cavinder, was half Indian. My Great-Aunt Ruth (standing behind Job) demonstrated clear Native American facial features. Seated with Job is my great-grandmother, Mary Landis, and behind her, my Great-Aunt Edith. Right, so what am I, then? Somewhere way back, part of my family (the Newlands) came over from Scotland, another part from Germany (the Webers and the Leningers), still another part from Ireland (the Cavinders). My paternal grandmother’s maiden name was Henry and the other side of her family were the Hamiltons. So, English, then? But wait: The name Henry, if you check back, is Norman and the Normans were originally Norsemen (Vikings), who settled in France. So, French, then? But then there’s that other part, the British Isles part, what about that? Well, let’s simplify: The British Isles were originally settled by Germanic tribes (Anglo Saxons). And then there’s that other part of my family that’s German and the Norsemen were the originators of the Germanic tribes, Teutonic peoples all. So, okay, if we’re going to racially profile, then I’m Teutonic, right? I mean if I were just now moving to the USA and they wanted to figure out which pigeonhole to place me in, “race: Teutonic”, wouldn’t it be? But wait just a darn minute, now. I get to the States and who do I find there, since…um, forever? 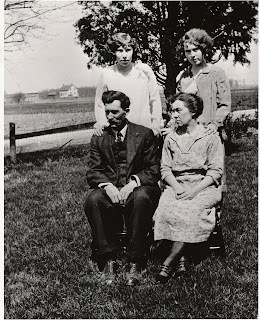 My Native American great-grandfather’s maternal family. So what the heck am I doing immigrating, since ‘we Indians’ once owned the place. But then, that racially profiles me too, doesn’t it? Yes, definitely, unquestionably, Teutonic-Celtic-Native American…I think. My point here is that there is no such race as “Latino”. Race is all about skin color – and implicitly profiles people anyway, since there is no race but the human race, with the rest being a matter of complexion and environmental adaptation. Trace us back far enough and, if noted paleontologist Richard Leaky is right, we all started out black, on the plains of Africa. As Shakira puts it, we’re all Africa (waka-waka). This thing of classifying people from ‘south of the border’ as “race: Latino” is just the Federal government’s ‘secret’ code for, “This person speaks Spanish and comes from ‘someplace down there’. Nor should it be an issue in the decision to grant or not grant a visa, since just by placing a race-heading on a visa application, the government is implicitly discriminating by bringing a piece of data into the mix that will permit those making the final decision to decide on the basis of skin color/‘ethnicity’. We are all, then, mixed-race, in a sense…well, except for (if Leaky is right) the purest of African tribes. The population of Argentina as a whole is a good case in point. Argentina, like the United States, is an immigrant nation, a melting-pot, if you will. Just as in the States the most common ethnic combination is Scots-Irish, English and Germanic, in Argentina, the majority of the population is made up of people of Italian and Spanish origin. Another large segment of the population is made up of people of criollo descent (the mix of Spanish and Amer-Indian bloods). These last are people who would immediately be profiled as “Latinos” because of their dark hair, eyes and complexion, if they were to try to move to the United States. The others would have to speak before their “race” could be determined. Since Argentina’s history with its natives is much like that of the United States – the Indians were, as in North America, systematically removed, driven out, pushed westward, pursued and slaughtered in order to take their land away and give it to white European settlers – there is only a small pure American Indian population. Most of these people would probably also immediately be considered ‘Latinos’ by US Immigration (and curious police officers in the state of Arizona), since they are dark, speak Spanish and come from “south of the border”. But Argentina also has an eclectic mix of other ethnicities: The country’s quintessential literary figure, Jorge Luis Borges, once quipped: “The Mexicans descended from the Aztecs, the Peruvians from the Incas and the Argentines from boats.” I have known Anglo-Argentines, German-Argentines, Czech-Argentines, Irish-Argentines, Scottish-Argentines, Welsh-Argentines, African-Argentines, Rumanian-Argentines, French-Argentines, Basque-Argentines, Slovenian-Argentines, Austrian-Argentines, Armenian-Argentines, Syrian-Argentines, Lebanese-Argentines, Russian-Argentines, Greek-Argentines, Turkish-Argentines, Japanese-Argentines, Chinese-Argentines, Korean-Argentines, and so on. I am willing to bet that most of these would be profiled as “race: Latino” because of their nationality and language were they to try to immigrate to the United States – with the exception of the “Orientals” (many of whose families have lived for generations in Argentina) since, despite speaking Spanish and having Latin American passports they don’t “look Latino”. People who are “tough on immigration” but who don’t want to give the impression of being racist will argue that the problem isn’t immigration as such, but the ‘illegals’. (That they are talking about Hispanics is a given). But at the center of mainstream calls for ever-tougher immigration measures in the United States is a fear not just of undocumented immigrants of Hispanic descent or from so-called ‘Hispanic countries’, but also of the exponential expansion of the Latino community in the United States. This segment of the US population has increased more than four-fold since 1970 and is up 22% since the start of the 21st century. Predictions are that by 2050, nearly one in three Americans will be Hispano-American. The fear that is motivating demands from the fundamentalist right for the deportation of all Hispanic 'illegals' (this is the height of racial profiling) and radical measures to ensure that no more get into the country has little to do with either the lax immigration policies or the shaky border security that they cite. At its core, the issue is about the mainstream white population’s fear of its eventual loss of supremacy. I'm old enough to have grown up in the so-called civil rights era. I was reared in a predominately (98%) white Midwestern town where there were no blacks. (I see from the latest Census that this has changed: African Americans now form 0.19% of the town’s population – or approximately 18 people out of a total of 9,474). So I can recall hearing the facile racist arguments of white supremacist fundamentalists who, upon hearing of protest marches, riots and other disturbances taking place all over the United States in the 1950s and ‘60s, as blacks sought to back demands that their civil rights be respected, would snarl, “If they don’t like it here, we can always ship ‘em back to Africa.” In many cases, this suggestion was being made about people whose presence in North America pre-dated the arrival of the Mayflower, since African slave labor was already present in the then-Spanish colony of Florida in the mid-1500s. And Dutch slavers first traded African captives to the pre-Mayflower Virginia settlers in 1607. Historically, then, these African people were more American than the European ones who signed the Mayflower Compact. They just weren’t white Americans. Nor should we forget that during the country’s long immigration history, the push by rightwing fundamentalists to close the gates to certain types of immigrants is nothing new. Today it’s the “Hispanic problem”. Yesterday it was the “Polish problem”, the “Italian problem”, the “Irish problem”, the “Chinese problem”. And the problem has always been a two-way street: people from countries in political or economic turmoil seeking a new home and new horizons in combination with greedy economic interests only too happy to exploit the cheap, sometimes bordering on slave labor that these mass movements of desperate people could provide. The fact is that many of those who are the staunchest opponents to Hispanic immigration today are the descendants of people who came in droves to the United States and stayed by any means they could a century and a half ago. To hear these descendants tell it today, their families were welcomed with open arms and were respected and well treated because they knew how to appreciate what America offered them and America knew how to appreciate what they had to offer. It’s a nice story, and perhaps there were some cases like that, but generally speaking it is exactly that – a story. The fact is that every new immigrant group has had to carve a place for itself in American society. Typical of mass movements of any kind, the first ones to arrive have quickly staked their claim, fenced off their territory and then tried to keep any new aliens from coming in and messing up a good thing. The Irish (an ethnic group that today forms about 12% of the US population) are a case in point. Although Irishmen had formed part of the original colonies almost from the outset, the huge waves of Irish immigrants who arrived in the 19th century, and especially during the Great Irish Famine of the mid to late 1840s, arrived in the United States destitute and desperate. They, like many unskilled immigrants from the Hispanic community today, took the jobs that no one else wanted – hard, poorly paid jobs involving grueling manual labor. Notably, they were hired at starvation wages – beggars couldn’t be choosers – to do the grunt work in the building of much of America’s rapidly expanding infrastructure. They dug canals, laid rails, built ports and did any other task where picks, shovels, sledges and a strong back were required. They were often exploited and mistreated. During the civil war, the US government also exploited this wave of largely English-speaking immigration, drafting penniless Irishmen, with the promise of US citizenship, directly off the boat into the Army to serve as new cannon fodder in mounting massive offenses against rebel forces in the South. As Irish workers building the railroads became more consolidated and banded together to try and form unions, they were unceremoniously cast aside for newly arriving Chinese labor that would work for even less pay. The lot of 19th-century Irish immigrants in the United States was so grim that, following the civil war, they considered the wave of recently emancipated former slaves that migrated northward to be a competitive threat and there are reports from those times of blacks being attacked by Irish-immigrant mobs who beat, clubbed and stoned them. Problematic Irish immigration was, then, also a problem of desperate foreigners fitting perfectly into the exploitative designs of greedy business interests – the same problem as today’s, but with a different ethnicity. There appears to be a growing tendency among far-right thinkers today to consider the plight of the undocumented Hispanics as being their problem. It is of little importance to such anti-immigration activists how long these undocumented aliens have been inside the United States. If they don’t have the proper papers, these people say, they s hould be thrown out at once. This stance tends to see ‘illegals’ as lawbreakers who have whimsically and maliciously skulked across the border in flagrant contempt for sovereign US authority, so the ostensible solution is to round them up and send them packing. 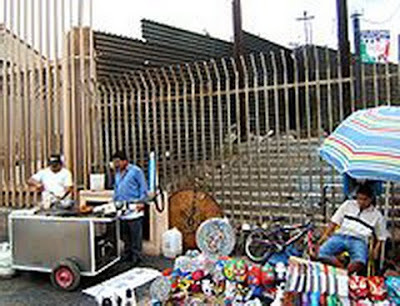 But to look at it this way is an oversimplification of the facts: the fact, for instance, that although it is illegal for them to be in the United States, certain American employers – traditionally in the agricultural and textile sectors but elsewhere as well – gladly hire them at starvation wages; the fact that lax policies in the past tacitly permitted undocumented workers to stay and make a home (albeit humble) for themselves in the USA despite not having a green card; the fact that precisely because they have family members who have lived legally in the States or have been born there, it ends up being, irrationally, next to impossible for them to get permanent residence visas, and so on and so forth. Therefore, the problem isn't theirs, at least not completely, but a problem that the United States government must address in some more rational and humanitarian way. As for those who claim that cleaning up the illegal immigration problem will create a new problem for the business activities that use ‘illegals’ as cheap labor, I can only say that, first, my heart absolutely bleeds for those shameless and unscrupulous exploiters, and second, that you can't have it both ways. You can’t hire undocumented workers as dirt-cheap labor and then turn around and not want to see them on the street. Nor can you clamor for the cheap goods and services that their labor provides but then expect them not to have a life beyond the fields or the sweatshop walls. This kind of hypocritical double standard is unethical and immoral and is a mindset that should have gone out with the Civil War and, if not, then at least with the advances fought and won in the civil rights era. Because there can be no kidding ourselves: Although they may be paid, if miserably, for what they do, the exploitation of the undocumented status of ‘illegals’ makes them the modern-day slaves of industrialized white America, and it makes their bosses the supremacist slave-drivers of the 21st century. 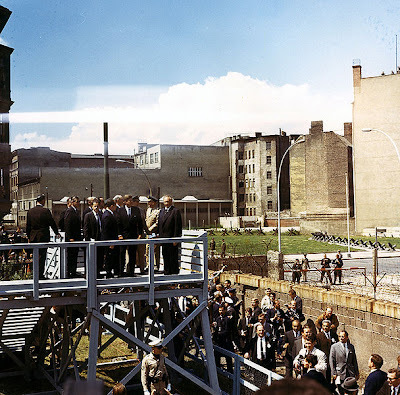 Caption: President John F. Kennedy and his entourage survey the Berlin Wall. "Ich bin ein Berliner," JFK declared. As I am writing this, an image keeps popping into my head of John F. Kennedy standing before the Berlin Wall and declaring: “Ich bin ein Berliner.” I was a boy at the time, but already a thinking, conscious human being and I recall feeling a thrill of excitement and pride at this admirable statesman’s declaration of war on that wall and on the totalitarian mentality on which it was constructed. Built by the repressive Soviet Bloc in 1961 to separate East and West Germany from one another, the Berlin Wall was the quintessential symbol of the Cold War. But it was also the symbol of the darkest kind of fundamentalism, of an archaic mindset that actually believed that an ideological line could be drawn in the sand and a material wall erected to separate one culture (political in this case) from another, that barbed wire, searchlights and machine guns could keep ideas and advancement from spreading, that harsh repression was a viable way to impose a system or that such repression was sufficient to suppress people’s natural desire for freedom, progress and a better, happier life. 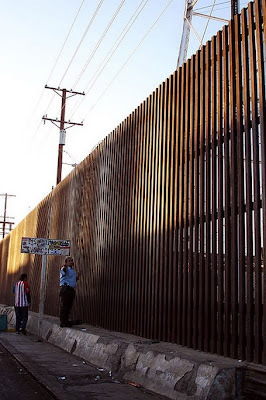 Now when I see footage of our border with Mexico, I can’t help asking myself how the same nation that fought so hard, so long and with such sound reason against the ideological more than the material symbol of the Berlin Wall can now be supporting the building of just as horrendous and futile a wall between it and one of its two closest neighbors. A political cartoon is taking shape in my mind that makes me sorry drawing is not one of my strong talents: It shows America’s “Berlin Wall” manned by armed Border Guards along the Río Grande. On the other side of the wall, standing waist deep in water are Mexican immigrants clamoring to come over. On their shoulder stand other immigrants and on their shoulders, still others. A dialog balloon coming from a guard’s mouth says, “We gotta make it taller!” Behind the guards, facing the American side of the wall, wringing their hands, their faces wrenched with fear and worry, are a crowd of white Americans led by Bill O’Reilly, Rush Limbaugh and Glenn Beck. A dialog balloon coming from a frightened-looking Beck says “Gosh fellas! I sure as heck hope it holds.” And while all of their eyes are on ‘The Wall’ the tide of change con tinues with the birth of a million North American Hispanics a year behind their backs. Because this is precisely what’s happening. 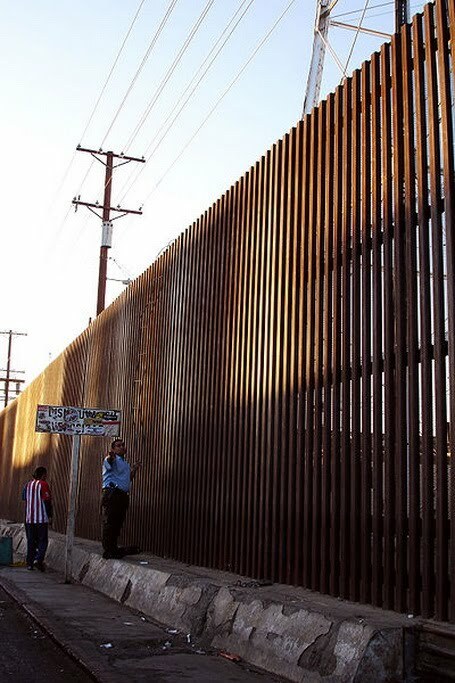 The point that the anti-immigration (e.g., anti-Hispanic) fundamentalists are too self-obsessed and too obtuse to understand is that building a wall between themselves and the Hispanic world is as idiotic and futile an idea as the Berlin Wall was. While they are desperately seeking to plug the leaks in the illegal immigration dike with their fingers and toes, the inexorable trend toward a changing face (a pan-American face, if you will) for North America continues unabated. There were 9 million Hispanics and North American-born Latinos living in the United States in the 1970s. Today they number over 40 million or about 14 percent of the population. And the current birth rate among the Hispanic community in the United States totals over one million babies per year. This is a trend that isn’t going away no matter how scared fundamentalist white supremacists might be of losing their grip on power. The worst thing that could happen is that the immigration issue should drive an ever-increasing wedge between the white and Hispanic communities. Should that happen, the future scenario could only be one of increasing tension between the two. The violence, disruptions, riots and bitterness that marked the white versus black integration clashes of the 1950s and ‘60s need to be established as a lesson learned in this respect. 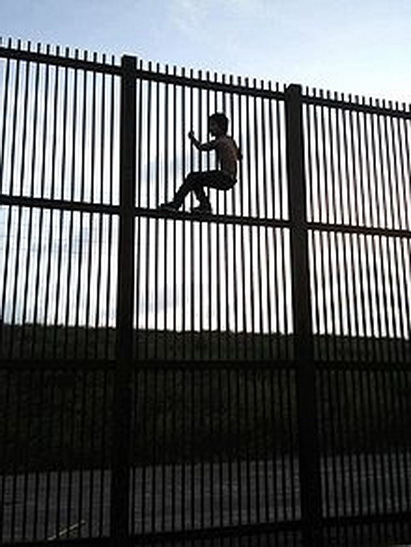 The Obama administration has the singular opportunity to take strides toward avoiding this kind of scenario, not by bowing to pressure for a “bigger and better wall”, but by studying creative ways to develop more rational immigration legislation and to take advantage of the extraordinary potential of a multi-racial, multi-cultural America. "I certainly do not agree with the notion that one is a white supremacist when one does not wish to lose influence as a European American in the States over Hispanics. "The idea shared by many people is that Latin America as a society lacks certain traits that have taken the US to days of glory. This says nothing about individuals, but of a society as a whole. Ever asked yourself questions such as why in Argentina they have so many holidays, and still they move forward those that fall on a weekend? Contrast that with the coming 4th of July. Or why they take so long to solve crimes here, if ever? Or why honest decent hard-working people are scared and live behind bars while criminals get caught one day and are left free the next? "I believe Hispanics can contribute interesting and positive traits, but it really scares me to even conceive the idea of a Hispanic-ruled America. I'm far from being a white supremacist, but you can call me obtuse and those other epithets if you believe they apply to me." Thanks for your comment, Roddie. The point of this piece is that no matter how scared you say you are of growing Hispanic influence in the United States, this is already a major and continuous trend and will continue to be for a long time to come. If non-Hispanics take a confrontational attitude to this trend, they can expect to foster a head-on clash in the future. It is the difference between an open and a closed attitude. No wanting it to happen won't stop it from happening, just as whites weren't able, fortunately, to halt the tide of rising black influence. But until they learned that lesson, the entire US population had to suffer through years of turmoil, violence and confrontation. That should serve as a lesson and help whites to take a more constructive attitude, this time, in assimilating the Hispanic phenomenon. Trying to halt it by putting up fences and fostering hostility will be like trying to cover the sun with your hand. Roddie: I suggest you forward your fears about a Hispanic-ruled America (you meant the U.S., right?) to Justice Sotomayor. Maybe she can dispel your concerns; or maybe not, because according to your point of view, she is part of the Hispanic fifth column that's already corrupting this country. Dan's article, on the other hand, is an extraordinary contribution to understand what the U.S. really is: a melting-encilada pot of Europeo-Amerindian-Afro-Asian peoples, the first true global nation. Dan, this is a great article which I've read with all sorts of emotions, ideas, referentials and contradictory feelings popping up from beginning to end. I could zoom in from different angles -no pun intended, the British are germanic precisely because they've more Angle in them than Roman- and talk for hours after reading this! (Lucky you that I haven't moved to my wee bungalow in Barrio El Faldeo yet..). I certainly think Roddie's criticism is way off-track. Argentina is definitely not going thru' a good period, to put it mildly, but what a disappointment the U.S. has inflicted on millions of gobal admirers due to the crass, occult corruption on Wall Street, leading to bankrupcy or utter destitution of families inside and outside of the U.S. The images in the press of people unable to pay their morgages being thrown out into the street has horrified the world. Not that the europeans have been much kindlier. I don't think this is precisely the moment for U.S. citizens to feel so proud of their country; maybe a little humility and solidarity with so-called third world countries would makeover the yanquees' tarnished image. Large populations are now looking towards China, India and even Brazil as role models. Obama has a tough job and very little time for the famous 'change is possible' slogan of his campaign. Getting that goddammed wall down is one of his URGENT tasks after his wobbly success with the health issue and his apparent failure with Guantanamo (if anything, more people are dying trying to get across where the wall ends and the territory is unspeakably inhospitable). My sick husband's Peruvian assistant says that nowadays Peruvians who arrive in Mexico have to pay U.S.$ 14.000.- to the mafiosi who trundle them into the desert in old buses and make them get off far from the U.S. border guards where the wall ends. A map is drawn on the sand for them...YES, I'm speaking of now, the present, TODAY. Only 10 years ago her brother got into the U.S. by paying U.S.$ 200.-!! He's still there, has a family, and will acquire legal status in New York, thanks to new regulations in that area. Am I going off-track also? Perhaps. I happen to be reading 'Los gauchos judíos' by Alberto Gerchunoff! About the first Jewish settlements in Entre Ríos; what a wonderful book, such marvellous prose, almost poetical...Here too, Dan, may I add another ethnic 'mix' in Argentina, an extremely difficult one to disentagle. Those Jews were from Russia and Spain, mostly; and the delightful bits are about the jewish lasses eloping with the local young gauchos, who were a mix of...I've gone full circle! I'll add one juicy bone to gnaw at & leave you, for now. The hispanics who conquered our regions were a mix of latins, moors, jews, gipsies & 'marranos'. Colón may have been a converted jew, he needed the funds & that was the way to get some help. Once here, the first Spaniards mated with the original dwellers' lasses, since they brought no women of their own till much later. So my only nit here, Dan, is your phrasing 'Spanish - Ameri-Indian'. It's a lot more complicated, and frankly, there never were any 'indians' in any part of the also wrongly named 'americas'. Do forgive these wanderings of my mind. Sylvia, as always, a great pleasure to read your thought-provoking comments. Isn't diversity wonderful???!!! How pathetically dull fundamentalism seems to me and, I suspect, to anyone with a grain of creativity and imagination. Even in modern science the message that should be filtering down to even the most hard-headed among us is that diversity is the key to survival and that the world that forgets this may end up being populated exclusively by rats, cockroaches and transgenic soybeans. You're right about my oversimplification of the mix in Argentina. I didn't really have the space (governed by the attention span of the reader as perceived by me) to go into greater detail and the essay focused on the United States, with Argentina forming a secondary case in point. I was really concentrating on the waves of later immigration to Argentina and trying to give an overview of the population. But your point is well taken. A great piece, the kind of journalism I wish I read more in what's left of newspapers...but, of course, they would never publish a piece that doesn't reflect the capitalism-on-amphetamines mindset of the nation's power brokers. I like Sylvia's use of the word "occult." Capitalism has risen to the point of a quasi-spiritualism not unlike the sort the Nazis put to their use, a mystical belief in the "free" market, exemplified by Thomas L. Friedman, the most junk-filled mind to pollute the op-ed pages. As to your argument regarding riots, I see an even deeper possibility lurking: that all the minorities will turn upon one another in a fight for the scraps tossed to them. Everything is not political; everything is economic. If the "flood of immigrants" is indeed negative, then it's apt punishment for underhanded American support of Latin American regimes, including use of torture, to achieve the "economic miracle." Like all "miracles," only a few people see them. Unfortunately, minorities tend to turn upon one another, and I include in minorities "white trash," who've more in common with blacks than they have with most whites. If only they would all unleash this violence upon those controlling the vast majority of this nation's wealth, then perhaps something could be accomplished. As to fear of Hispanic rule, most Hispanics are culturally conservative. Thus, the Republicans have nothing to fear but getting what they wanted...only, in a different color. Thanks, Paul, for your extraordinarily insightful and detailed comments. I would expect no less coming from you. Your point about the minorities turning on each other is a good one. I think that most of the time it isn't a matter of minorities in conflict, but, as you surmise, different marginalized social groups fighting over the lesser stuff that affluent society leaves behind. The issue isn't race but poverty. One of the best examples of this is what anyone can see, if they have the stomach to walk the streets of downtown Buenos Aires late at night and observe 'globalization' at work. In an ever more cruelly Nazi-capitalist world, one of the 'benefits' of globalization has been the arrival of fast-food in a country that was once one of the world's best fed. Parallel to this - and to the economic disasters wrought by years of association with the IMF - have come growing ranks of homeless and jobless thousands who, by night, make the doorways, abandoned lots and condemned buildings of the city their home. 'Suppertime' is when the burgeoning numbers of McDonald's and Burger Kings close and the employees haul out the huge black garbage bags bearing the remains of hundreds of "happy meals" left unfinished by the McOverfed diners. Impoverished children and adults alike scramble to pounce on the bags and gather these emblematic scraps of a globalized world, whose greatest contributioon to society so far has been American fast food and the uniformly ugly stackable plastic chairs that are an identical eyesore from Alaska to Tierra del Fuego and from Florida to Timbuktu. As I mention in the piece, this desperate scrounging for the leavings of society is nothing new, as witnessed by violent clashes between newly emancipated blacks and destitute Irish immigrants in 19th-century New York and indeed by battlefield confrontations between "natives" and immigrants so well depicted in Scorcese's "Gangs of New York". Completely off topic, but I am curious if you happen to know if your Job Cavinder is related to the Cavinders in Indiana, like to Alonzo Cavinder? Hi "Clan". The short answer is, I don't know. Unfortunately, my Great-Grandpa Cavinder was a very laconic man and I know nothing of his family before him. It wouldn't surprise me, however, if the Ohio and Indiana Cavinders were related, since it's not a very common surname and every Cavinder I've met in Ohio is a "cousin" of some kind. Thanks so much for reading this blog, Ezequiel. I'd be more than pleased to help you if I can. I don't know how many of the entries published here you've read but there are several on the Malvinas/Falklands issue, and I feel my viewpoint is fairly unique. I'll contact you at your private e-mail address.